Everybody knows you should tack on a header. The problem is that tacking includes a penalty – distance lost to weather (DLw – see Tack Analysis). Your DLw first needs to be paid back before your tack is a gainer. And that depends on the amount and duration of the shift. You gain to weather while the wind is a lift, and the bigger the shift, the faster you gain and the less time the shift has to last. If the shift peters out before you make back your DLw, you will lose. Break-even tacking (the BET) describes the minimum conditions under which you will gain by tacking. The break-even line is how much distance you lose in a tack. OS5 includes a tool to automatically record, analyze and display your tacks. With this tool, you can find out how much DLw you actually have. See Tack Tracker. 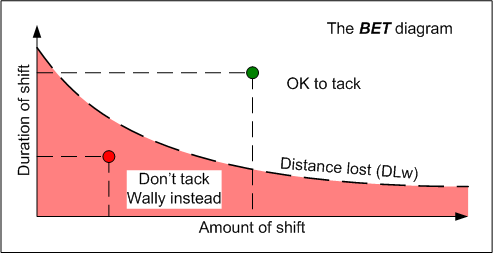 If shift conditions and your DLw fail to meet the minimum conditions, you can still gain from the shift without tacking by doing the Wally. Point you to where you need to go. Moving to one side of the course because of a wind or current advantage there. Position yourself advantageously relative to your competition. Consolidate your lead by covering the fleet. Set you on starboard for right-of-way advantage. Avoid obstacles or boats with the right-of-way. The decision to tack for these situations is not discretionary. However, most of the time, you are where you want to be and going the direction you want to go. In this case, the tacking decision is to take advantage of oscillating wind. Tacking carries with it a certain amount of risk and penalty with a hoped for reward at the end. The more you know about the risk vs. reward, the more likely you are to make the right decision (see Wind Statistics). In this discussion, the wind is shifting left and right but its average direction remains constant. In this kind of condition it is a lot faster to maximize your Vmg up the average wind direction rather than the shifted wind direction. This is the principle behind the Wally. Most of the time you are fleet racing. Your objective is getting around the course as fast as possible. Your metric is best Vmg upwind with as little loss to weather (DLw – see Tack Analysis) as possible. Sometimes though, there is somebody you have to beat. It doesn’t matter whether you finish in the middle, you must beat this guy. Your objective is sticking it to him and to hell with the rest of the fleet. In this case, pumping your lateral separation relative to him is a big gainer, and may trump your tack/wally decision (see Lateral Separation). Tack or Wally? How do you decide? We are going to relate speed differences to rating numbers (see How to Calculate Seconds per Mile). Here we see 2 boats on port. Green Machine detects a small shift and tacks onto starboard. Dead Red doesn’t notice and keeps going, bearing away to the new wind because his telltales tell him to. 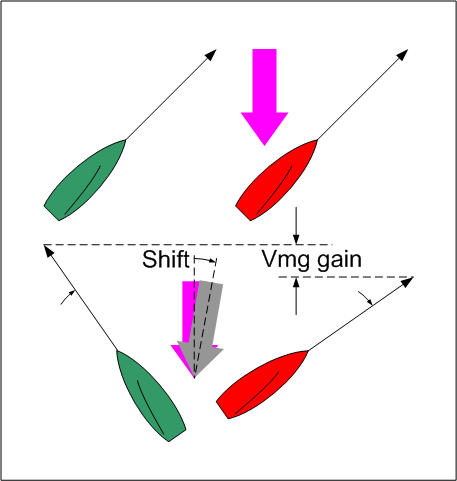 A 5º shift is equivalent to about 1 knot of boatspeed or 100 seconds/mile! Distance lost to weather (DLw). All tacks carry a loss, and blown tacks are always a possibility. The expected gain needs to pay back this loss before it becomes one. The hoped-for wind shift peters out before you make back your tack loss. You certainly shouldn’t tack if you won’t make up for the DLw. So how do you decide this? The first thing is to know what a tack will cost you. See Tack Analysis and Tack Score for guidance on this. The second thing is deciding how big the shift is and how long it is likely to last. The bigger and longer the shift, the safer it is to use it.